All about me pennant: Use this all about me banner with apples across the top and attach it to an owl using a string for your back to school craft. The all about me pennants are 1/2 a page in size and will be printed two to a page. There are two versions of the all about me pennant. The first version asks the student's name, age, birthday, grade, favorite color, favorite animal, and favorite foods. At the bottom of the all about me surveys, the students will write what they want to be when they grow up. The student will also draw a self portrait. The second all about me banner is for younger students. The students will write their names, age, and then color a block with their favorite color. These students will also draw a self portrait. There are four different owls to choose to use with your pennants. The students will color or paint their owls in unique ways and attach the pennants around the necks of the owls using a string. 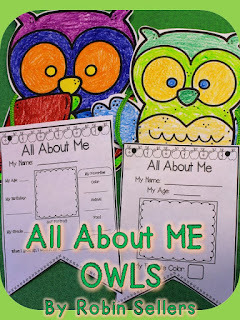 The all about me craft can be used with or without the owls but I suggest placing the all about me owls on your classroom bulletin board and using the phrase Whoo I Am or Whoo am I? as the heading. These will go well with your owl classroom themes too.